Kathie is a friend to this blog and her book is well worth reading. Congratulations Kathie, the honor is well deserved. 5 years later and Katrina ground zero is still the red headed step child: Katrina plus 5. So what? The same old tired song most everyone is sick of hearing. Well, the WaPo at least put a link up to a few pics from the Mississippi Gulf Coast but little else and today’s feature story is about the trainwreck that is the post Katrina recovery in New Orleans from incompetent leadership at NOPD and from the Mayor, Ray Nagin to the outright thievery and unbridled corruption that is the Jeffersons. The media likes train wrecks. 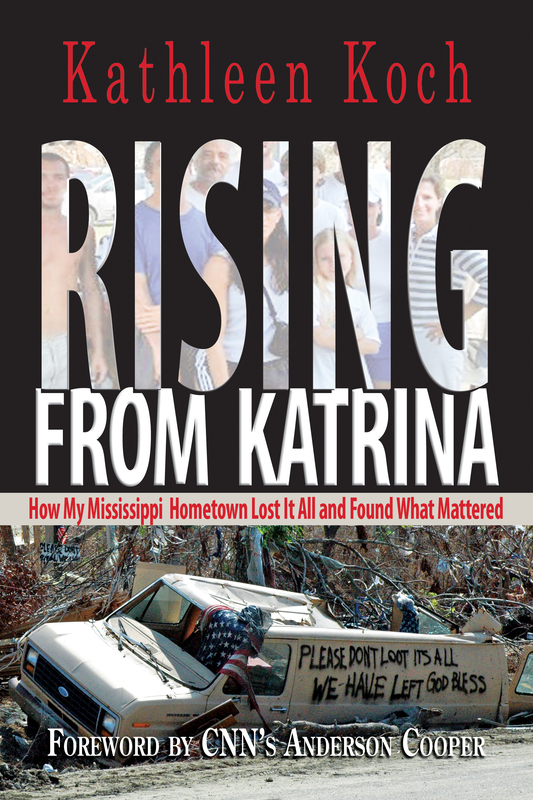 Author Posted on August 27, 2010 Categories SopTags Hurricane Katrina, Kathleen Koch, Post-Katrina recovery, Rising From Katrina: How My Mississippi Hometown Lost It All and Found What Mattered, Washington Post20 Comments on 5 years later and Katrina ground zero is still the red headed step child: Katrina plus 5. So what? The same old tired song most everyone is sick of hearing. It was my pleasure to renew acquaintances with Kathleen Koch yesterday afternoon as we chatted about her upcoming book, How My Mississippi Hometown Lost It All and Found What Mattered. Kathleen is a Bay St Louis girl made good who ended up at CNN as a general assignment reporter covering aviation, the White House, Congress and the Pentagon during her 18 year run with the network. I went to school with Kathleen’s kid sister and my siblings were all around the same general age as the Koch kids so she was happily surprised to find out Sop was someone with whom she was familiar from back in the day. It was neat to catch up. I ran across the CNN Presents episode The Town that Fought Back on You Tube and watched it again. It is interesting to see what has changed, what the issues were and still are from the time it was shot in 2006 to the present. The Oklahoma City litigation is over and State Farm’s bad behavior there has been completely revealed. We have gone from thousands of Scruggs Katrina Group suits to less than the 180 today that now must seek new lawyers with Friday’s disqualification of the Scruggs successor Katrina Litigation Group. We find that State Farm claims adjusters ordering additional engineering reports when they didn’t like the answer on the first one was not SOP per Wayne Drinkwater yet it happened a good bit. Still there is no explanation why it happened. FEMA trailers have since given way to cottages and many more people are back in their homes though we still lack affordable housing for the working poor. Life has returned to the new post Katrina normal but things will never be the same as they were before the storm. The political fight for insurance solutions in HR 3121 had not yet begun in the Summer of 2006. How time flies….